Cottage situated in a panoramic position on the hills of Val di Cecina about 4 km from the village of Pomarance. The house has been converted into the annexe of a farm run by the owners. The interior furnishings are well cared for, as well as outside the veranda overlooking the pool and the vallata. At your disposal a large pool of 9 x 4.5 meters. At about 2 km from the Villa is the riding. On request you can book dinners with tasting of typical Tuscan dishes and products. Location is ideal for nature walks and spend a quiet and comfortable holidays in the Tuscan countryside. Located 25 minutes drive from the Etruscan town of Volterra and the Tyrrhenian coast: the sea is interesting for its Etruscan ruins. 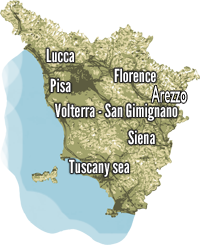 About an hour’s drive you can reach the important cities of Tuscany: Florence, Pisa and Siena. The villa is located in one of the most charming of the Val di Cecina. Located on a hill from where you can enjoy endless panoramic 360-degree range from Volterra, the Fortress of Sillano, Monterufoli Nature Reserve, and the ancient villages of Micciano and Libbiano. The apartment has a spacious living room, two bedrooms, kitchen and bathroom. Equipped with a porch and a pergola of 60 square meters equipped to fully enjoy the surrounding landscape in full relax. Rates accommodation include: linen and towels, everything you need for cooking fuel, heating, swimming pool 9m x 4.5m, Hmax1, 50 m (open from May to September) and parking.